Do you frequently drive at night? If so, the Toyota Tacoma has the features to help you stay safe on the road. You can get this popular mid-sized pickup truck with Automatic High Beams and an intelligent Lane-Departure Alert system. The Tacoma is available to Brunswick drivers at Dayton Toyota. The Automatic High Beam system turns on whenever you're driving 25 MPH or higher. A camera inside the vehicle monitors lighting conditions and automatically toggles between high and low beam accordingly. This helps you see more of the road as you're driving. If another vehicle approaches, the system will register the headlights and switch to low beam mode for safety. The Lane-Departure Alert system is designed to keep you alert. The in-vehicle cameras are capable of reading road markings. Once you reach speeds of 32 MPH or more, the system will keep track of the markings and the vehicle's location within them. 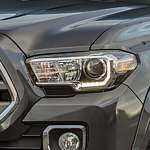 If you veer into the next lane, the Tacoma will provide audible and visual alerts.